At 4 a.m. I woke up to very serious rocking and it seemed a high speed chase. Things were knocking and cracking as most things do on a ship in motion. But I didn’t think much about it other than Woe, More Bad Weather! I’ll never get on that treadmill. But I was able to sink back into a deep sleep. 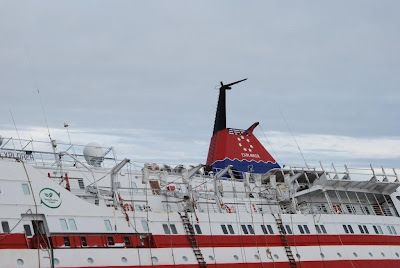 Then about 5:30 the ship’s communicator was on the PA systems piped into our rooms saying that at 1:35 a.m. in the night our ship received a distress call from the ship Explorer [also see GAP Adventures], once a sister ship and the first ever to take tourist interested in environmental issues on excursions through Antarctica. The communicator said very calmly that our captain had immediately made the decision to turn around and head for the sinking ship 60 miles away. We were the first to hear the SOS and to do so. 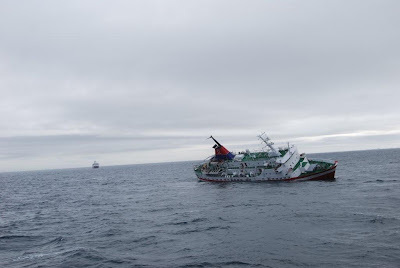 The passengers and crew had abandoned ship at 3 in the morning as water flooded the engine room and the electrical system no longer functioned. (Imagine the fright of that in the middle of the night in freezing Antarctica!) 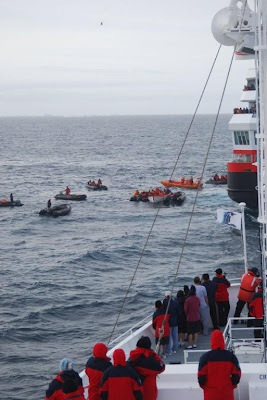 The 150 passengers and crew had been loaded into life boats and Zodiacs at 3 a.m. and the soonest we could get there would be about 7 a.m. 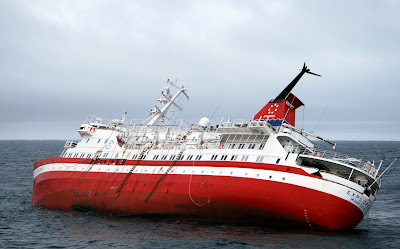 Meanwhile, a large Norweigan ship [NordNorge] notified us they too were in the zone. 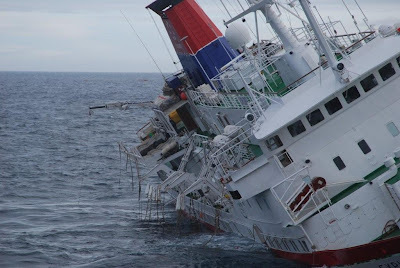 They could carry 1000 passengers and had only 400 guests aboard. 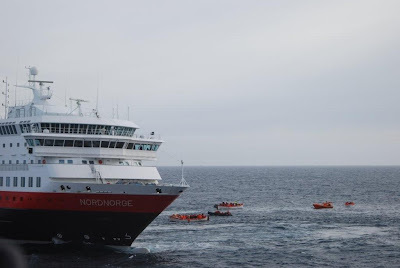 So we ran along side of that ship for an hour attempting to get to the abandoned people (mostly Canadians and Americans) in life boats as soon as possible. 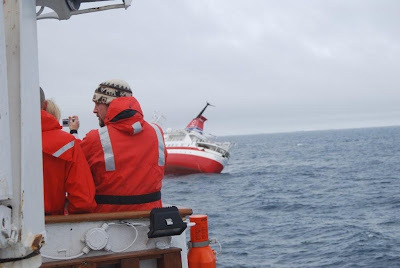 Most of us hopped out of bed with urgency and went to the decks with cameras and thick jackets in hand. We grabbed a cup of coffee or tea and a homemade cranberry muffin made for early risers on the upper deck. Whether professional or amateur, each of us became journalistic recorders, photographing every little step and event. We were continually fed information as all our staff kept right on top of what was going on, meanwhile assembling our own emergency supplies and blankets, just in case. If there was cases of hypothermia, those would be brought to our ship. We have a doctor who specializes in that. 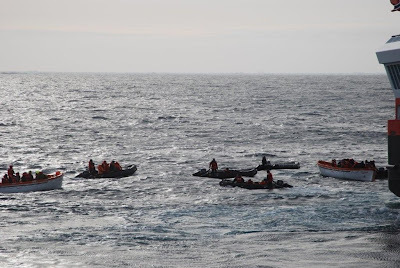 From a distance, we could see the dots of orange and white life boats in the water and not far away the sad sad Explorer listing heavily to one side. Apparently, an ice berg had been rammed in the night. One would think that all the fancy machines and measuring things of modern times would prevent another Titanic. But it happens. I noticed ice floating and breaking up where it hadn’t been floating when we passed earlier in the day, even as we were rushing to get there. Conditions change rapidly. 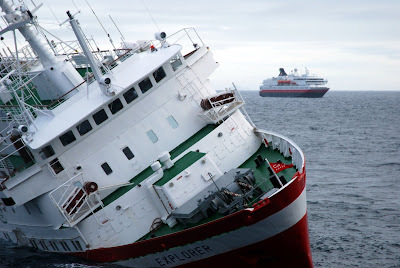 I offered my services as a counselor - chaplain if needed - in case we received some of the Explorer passengers or crew. Meanwhile, we passed two coveted whales (which people pay to see) and no one even noticed. 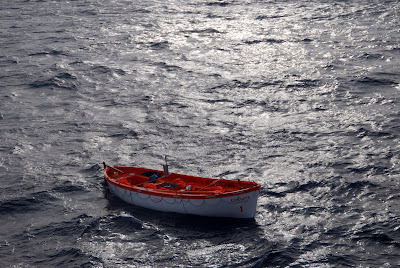 Our focus was on rescuing the people in distress. That is so good to know. 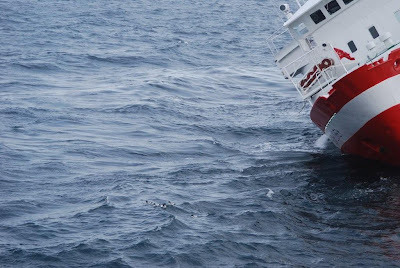 People in the maritime world do care and risk everything to save shipboard passengers and crews in remote and difficult places. 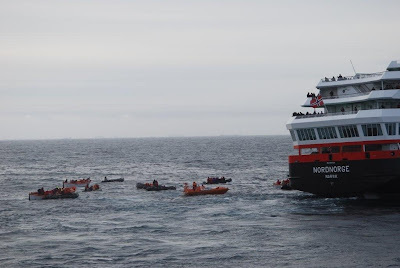 When we reached the disaster area, (the sun rose at 3:49) with the Norwegian ship beside us, immediately our staff jumped into Zodiacs and went to help - first taking on the passengers who were in the wooden life boats, which were then left to float wherever the wind took them. The Zodiacs got them quickly to the Nordgod. It took about an hour before everyone was on board. 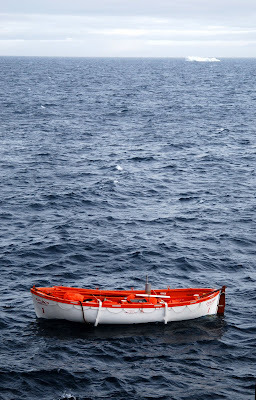 I was moved by the empty life boats, white with orange trim, left to float to their terminal destinies. Inside them one could see the plastic orange coverings, mylar blankets, and an odd metal thing with a pipe that could have been a motor but resembled a sort of fireplace. Maybe they did have heat or a motor. 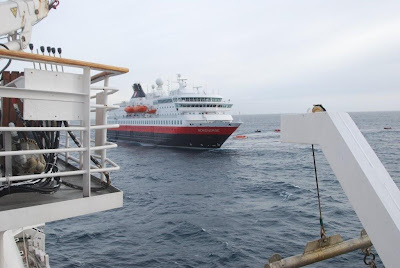 Our Endeavor took on the Explorer’s valuable Zodiacs, since we had the lifting hardware needed to rescue them, but first, all passengers and crew had to be cared for and warmed on the Norwegian ship. As we rocked slowly over to the listing Explorer, horns began to sound a sad cry and some of us shed tears. It was devastating to see a ship with such an amazing history - it had been rammed once before and survived - that looked just like ours leaning in such a dramatic angle with probably no hope of being saved from sea death. As one staffer said, "She was a tough lady. She may not be through yet." 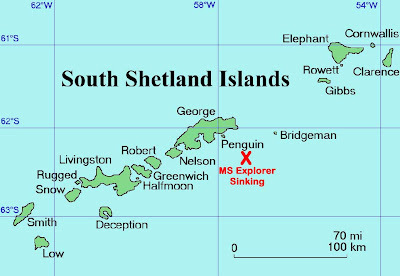 But, we were told there would be no time to assemble divers and the proper salvage services for the ship - after all we are in the most remote and inhospitable place in the world. And once the captain had finally abandoned the ship, it became fair game for pirates or anyone wanting to claim her. How awful. We are in a zone of no government, no rules and regulations, except those which maritimers have set up among themselves concerning respect and consideration for the ship and crew. Through it all, a helicopter watched the scene. I had hope it was a rescue vehicle - but of course in that helicopter, which may have come from a ne arby Argentine base, was the press - photographing and recording what we were witnessing live. (News and insurance rule the world.) Immediately it appeared on televisions all over the world. Some of our photographers sent off photographs on the ship’s special computer (my photographs won’t upload from here on the weak satellite we have for Internet). 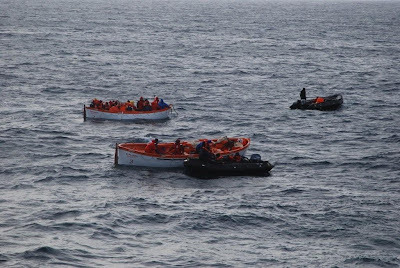 It surprised me that the passengers being rescued looked like us hovering in the Zodiacs - with red jackets, red wool caps, and orange life vests busted open. 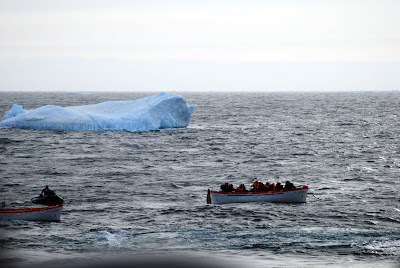 We were dressed like that in Zodiacs yesterday when we had our first visit with penguins. Our captain steared our ship Endeavor for a final circle around the dying Explorer as a tribute was played with hollow horn sounds. 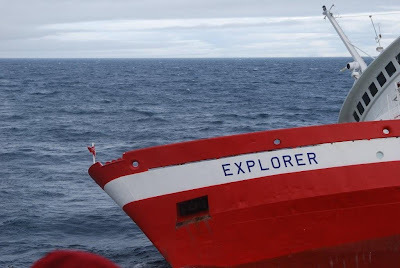 Many of our staff and crew, including the captain, had served on the Explorer in earlier times. It is also the ship that was featured on stamps from Antarctica and will be remembered by everyone who had stepped across its gang plank. God bless the souls in the sea. And God bless those who sail above it. We give a special thanks to Our Father post thanksgiving (we did have turkey breast and dressing and pumpkin pie last night) for saving the lives of the 150 plus people involved in this traumatic moment. If the winds had been stronger and the weather more violent, and ships further away, they would not have made it. On-scene photos by Audrey Gonzales, Memphis, TN. Click to enlarge in same window; click Back to return (don't close window). WikiMedia related and news sites are welcomed to reproduce these photos with attribution. 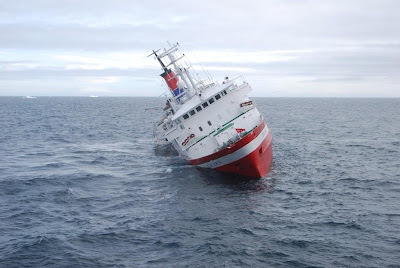 The NordNorge, one of the rescue ships. New and edited. NordNorge in the background. The previous two pictures photo-merged in Photoshop. WOW!Now that's something to write about! We are so relieved to know that you are safe! Fascinating first-hand account. I look forward to seeing your photos of the incident. It was eery to look at you pictures (awesome) taken from The Endeavour, which we had been on in September (Dalmatian Coast) and the pics of NordNorge our very first cruise up the Fjords of Norway in 2000! 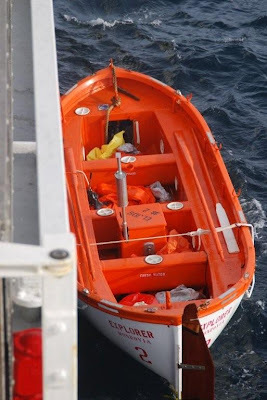 Hello Audrey, great comments on the rescue of the Explorer's passengers and crew. 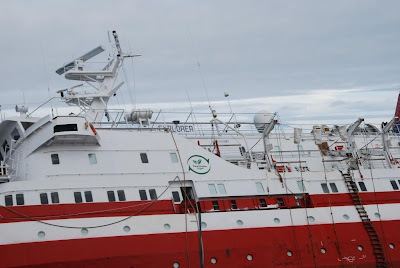 I was on Explorer for two week in September, visiting Greenland and Labrador. As a marine writer, I had two assignments to fulfill. I've had to follow up with news stories about the sinking. You took some great shots. Am I allowed to use one of the listing ship for Northwest Yachting magazine? It's published in Seattle. Thanks for listening.